Eighth graders didn't have Facebook or Twitter to share news back then, in January 2004. Bekah Sosland, 14 at the time, learned about a NASA rover landing on Mars when the bouncing-ball video on the next morning's Channel One news in her Fredericksburg, Texas, classroom caught her eye. "I wasn't particularly interested in space at the time," she recalled last week inside the spacecraft operations facility where she now works at NASA's Jet Propulsion Laboratory in Pasadena, Calif. "I remember I was talking with friends, and out of the corner of my eye I noticed this thing bouncing and rolling on a red surface. I watched as it stopped and opened up, and it had this rover inside." 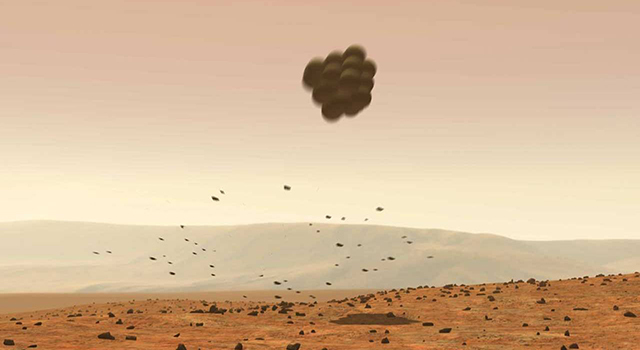 That animation portrayed how NASA landed the Mars rovers Spirit and Opportunity three weeks apart, using airbags to cushion the impact at the start of the missions, planned to last for three months. 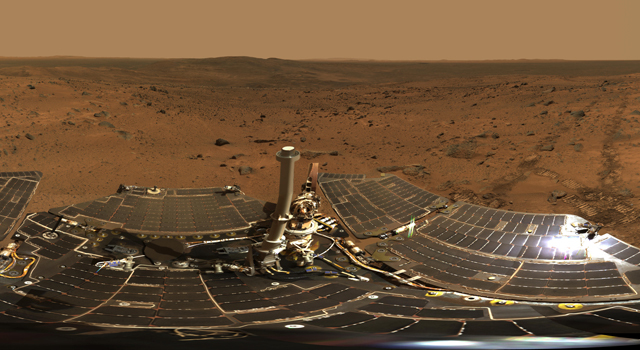 Spirit reached Mars on Jan. 4, 2004, Universal Time (Jan. 3, PST) and worked for six years. Opportunity landed on Jan. 25, UT (Jan. 24, PST) and is still exploring, with Sosland now on the team planning what it does each day. "I watched that news and said, 'This is amazing: a rover on another planet!' Gears started turning in my head that day about engineering and space -- thinking about a career. It was definitely a milestone in my life and something I'll always remember." On her path to that career, high-school teacher Brett Williams in Fredericksburg inspired her to build real rockets, and she completed a 2013 engineering degree from the University of Texas, Austin. But nobody in 2004 was predicting that either Spirit or Opportunity might still be roving Mars in summer 2013, which is when Sosland joined JPL. "I certainly never thought I'd have an opportunity to work on Opportunity," she said. "That only became possible because this mission has been going so incredibly long. The reason Opportunity has worked so long is the people who built it and operate it. I'm loving that I can be a part of this team now." 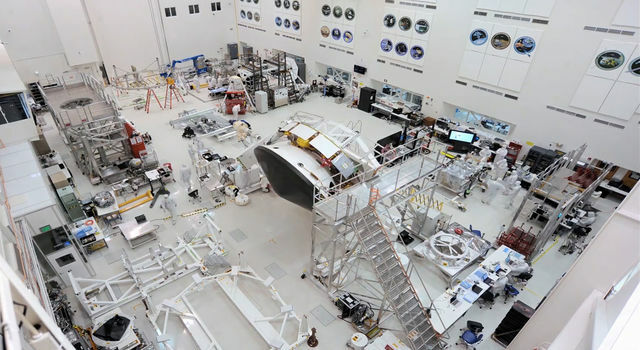 Most of the engineers who operated Spirit and Opportunity during the three-month prime missions in 2004 have switched to other projects, including later Mars spacecraft. Sosland is among several on Opportunity's team today who were in school a decade ago. Unlike her, Mike Seibert in late 2003 was eagerly tracking the run-up to the rover landings, while he was an engineering undergraduate at the University of Colorado. He had even ordered cardboard 3-D glasses in anticipation of images from stereo cameras on Spirit and Opportunity. "I was living in my fraternity's house in Boulder that January. 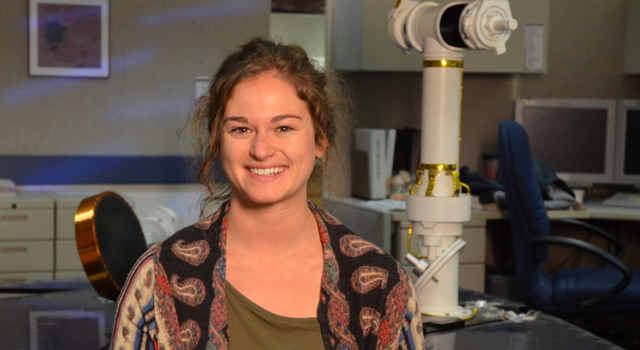 People thought I was weird, wearing 3-D glasses and looking at those pictures from Mars," said Seibert. Less than two years later, he was working on the rover team at JPL. He has, since then, served as a mission manager and in other roles for both Spirit and Opportunity and participated in many key moments of the extended missions. The dramatic landings and overland expeditions of Spirit and Opportunity have also inspired countless students who have not gained a chance to work on the rover team, but have participated in the adventure online by exploring images from the rovers or other activities. What an adventure it's been. Though Spirit and Opportunity were built as nearly identical twins, and both succeeded in the main goal of finding evidence for ancient watery environments on Mars, their stories diverged early. 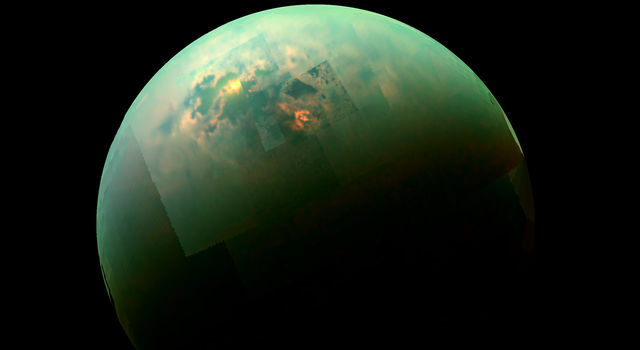 Spirit was sent to a crater where the basin's shape and apparent inflow channels seen from orbit suggested a lake once existed. Opportunity's landing area, almost exactly halfway around the planet, was selected mainly on the basis of a water-clue mineral detected from orbit, rather than landform shapes. Spirit's destination did not pan out initially. The crater may have held a lake, but if there are any lakebed sediments, they are thoroughly buried under later volcanic deposits. Opportunity, the luckier twin, landed a stone's throw from an exposure of layered rock that within weeks yielded compositional and textural evidence of a water-rich ancient environment. Within the initial three-month missions and without expectation of surviving a full year, each rover set out cross-country toward other destinations: hills on the horizon for Spirit and craters exposing deeper layers for Opportunity. Spirit drove a total of 4.8 miles (7.7 kilometers), some of that with one of its six wheels not rotating. Loss of use of a second wheel while the rover was in a sand trap contributed to the 2010 end of that mission. Opportunity has driven 24 miles (38.7 kilometers) and is still going strong. "Ultimately, it's not only how long the rovers work or how far they drive that's most important, but how much exploration and scientific discovery these missions have accomplished," said JPL's John Callas, project manager for NASA's Mars Exploration Rover Project, who has worked on the Spirit and Opportunity missions for more than 13 years. 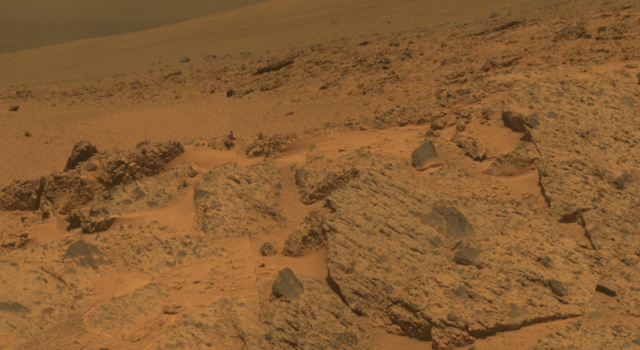 The science achievements have already provided major advances in understanding of Mars. "Because of the rovers' longevity, we essentially got four different landing sites for the price of two." The evidence the rovers glean from rocks at these sites may not be the only huge benefit of the adventures, though. Bekah Sosland and Mike Seibert may be examples of something even greater. Squyres said, "I'm incredibly proud of the science we've done on this mission, but in the end, perhaps our most important legacy will turn out to be the young people who have seen what we've done and made career choices based on that. If an outcome of our mission is to help inspire a new generation of explorers to do even better than we did, that will be the greatest thing we could have accomplished." The Mars Exploration Rover Project is one strong element in a robust program of NASA's ongoing and future Mars missions preparing for human missions there by the 2030s. 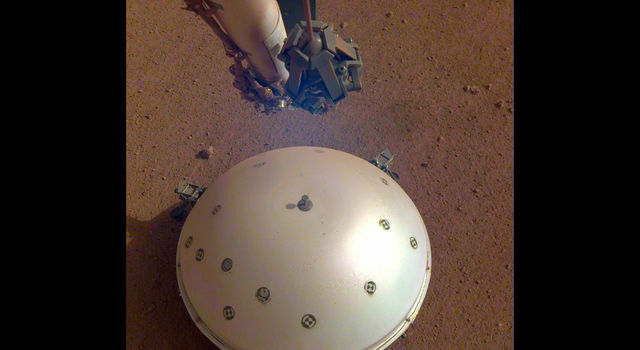 The Mars Odyssey and Mars Reconnaissance Orbiter missions have been studying the Red Planet since arriving there in 2001 and 2006, respectively. NASA's next-generation Mars rover, Curiosity, is examining an area that once offered conditions favorable for microbial life. NASA launched the Mars Atmosphere and Volatile Evolution, or MAVEN, mission two months ago, to begin orbiting in September 2014. The agency plans to launch a mission to Mars in 2016 called Interior Exploration using Seismic Investigations, Geodesy and Heat Transport, or InSight, to learn about the deep interior of Mars. A Curiosity-size rover planned for launch in 2020 has the task to check for evidence of past life on Mars. Special products for the 10th anniversary of the twin rovers' landings, including a gallery of selected images, are at http://mars.nasa.gov/mer10/ . JPL, a division of the California Institute of Technology in Pasadena, manages the Mars Exploration Rover Project for NASA's Science Mission Directorate, Washington. For more information about the project's twin rovers, Spirit and Opportunity, visit http://www.nasa.gov/rovers and http://marsrovers.jpl.nasa.gov . You can follow the project on Twitter and on Facebook at: http://twitter.com/MarsRovers and http://www.facebook.com/mars.rovers .